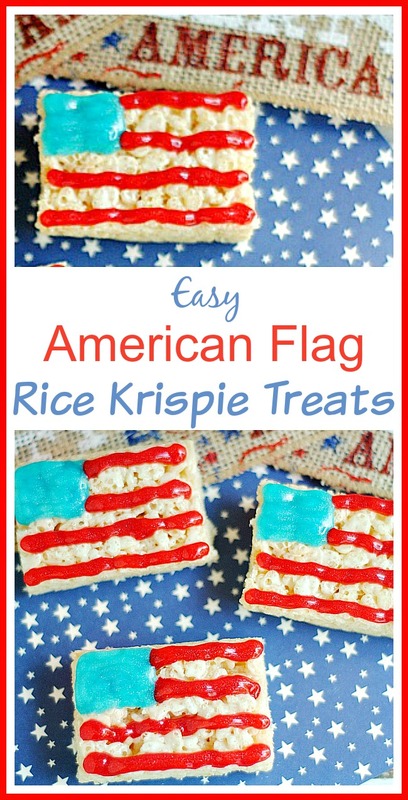 Do you need a super easy, no fuss, red white and blue dessert to cap off your Patriotic Holiday Party? Well I have a really good one to share with you today! 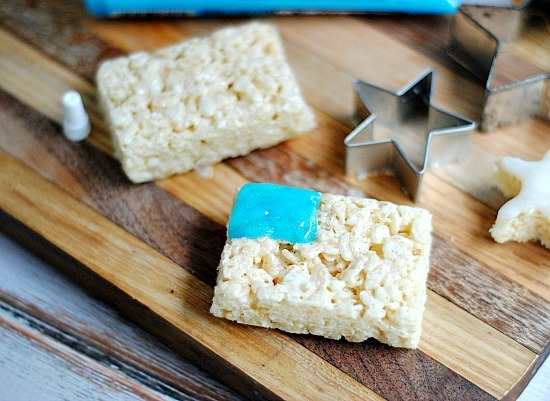 I love Rice Krispie Treats (as evidenced by all the Krispie Treat recipes I’ve already shared). These are very simple to make and really cute too. Something that everyone will love! 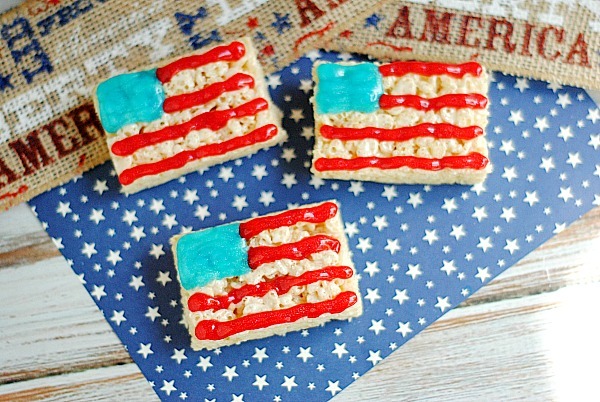 American Flag Rice Krispie Treats! 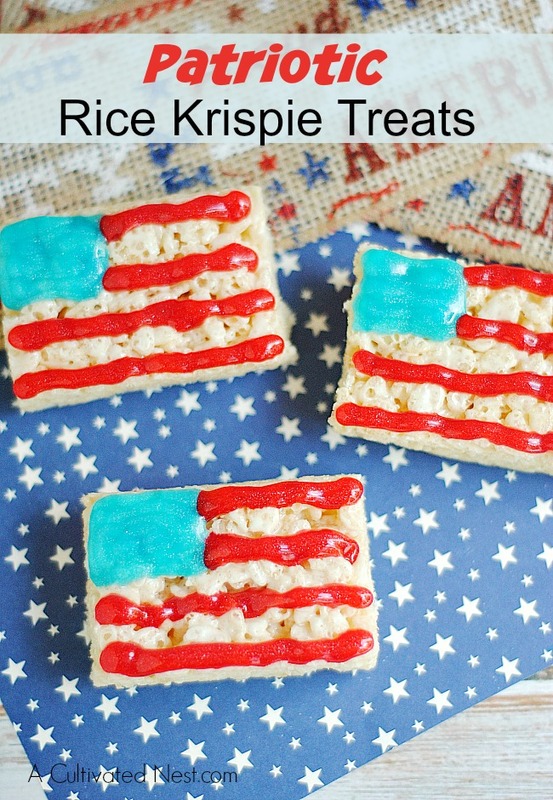 Rice Krispie Treats are very easy to make but you can also use store bought ones to make these patriotic krispie treats more convenient. For homemade Rice Krispie Treats all you have to do is melt 3 tablespoons of butter and 1 package (10 ounces) of Marshallows in the microwave on high (in a microwave safe bowl) for about 2-3 minutes. Stir that together until smooth and then add 6 cups of Krispie Cereal. Stir that all together and then press it all into a 13×9 inch pan that has been coated with cooking spray or lined with parchment paper. Allow it all to cool and set and then cut into rectangles. Then on to the decorating! *Makes 8 servings. 1 Rice Krispie Treat = 1 serving. If you’re using the packaged Kellogg’s Rice Krispie Treats, then open each Rice Krispie treat and discard the wrappers. Open the blue gel icing and snip the end of the tube open using a pair of scissors. Gently squeez the blue icing out of the tube making a small outline of a square in the corner of the Rice Krispie Treat. Fill the square in with the icing. Next, open the red icing and carefully add 4 stripes to the Rice Krispie Treat as shown in the photo: 2 next to the blue square and another 2 red stripe below it. That’s it! Wasn’t that easy and aren’t they cute! This recipe is for 8 treats but you certainly have waaay more icing that you can use in those tubes so you can make as many as need. « How to Use the iBotta App To Save Money! Those are so fun. I love them! Pinning for sure. My daughter would love making them too. Somehow you had fallen off my blog roll when I made a switch to .com. Getting you back on there so I don’t miss anything. Hope you are having a nice summer. Having a busy summer. We’re in the process of buying another house so busy packing and coordinating stuff! Hope you’re having a lovely summer! Those are too cute:) Enjoy your day and stay cool! HUGS! These are so cute! We have a huge gathering each year for the fireworks, I’m excited to add these treats to our menu! Thanks for sharing! 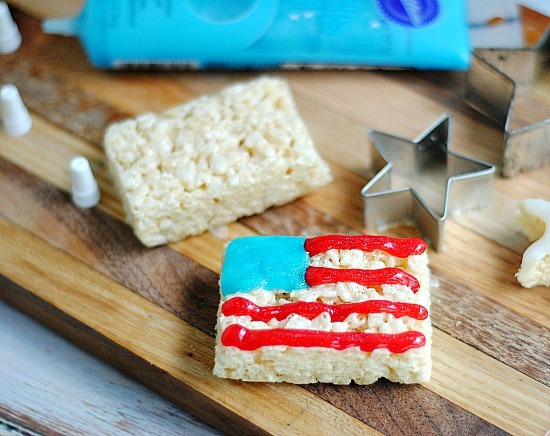 What a super fun patriotic treat! These are a great way to get the kids involved in party prep! Nice, love how easy it is too. Pinned & sharing. Easy for last minute too. Those are too cute!!! Thanks so much for taking the time to link up with us over at the #HomeMattersParty – we hope to see you again on Friday!